Where did this book come from? Canadians love to compare themselves to Americans. For me this habit began early. There were relatives from mysterious places like Minnesota. There were books, Little House on the Prairie and Eloise. An hour’s drive south, “across the line,” and there were totally different chocolate bars. And then one day, when I was a young teenager, Chip appeared at our door, an American draft dodger. We didn’t have a draft to dodge in Canada. What was it all about? 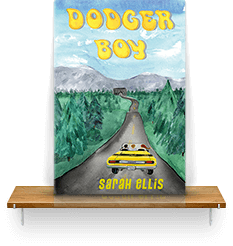 Dodger Boy isn’t Chip’s story but it is about the times he lived through. Scintillating prose, rich dialogue, and charming characterizations . . . whip-smart historical. I am just enamored of this book right now. A delight of a book. I absolutely loved Dodger Boy. It made me laugh in places, gave me some new ideas about a lot of things, and taught me quite a bit. It made me think about how much the world has changed (in many ways for the better!) in a relatively short amount of time. Whoever you are - kid, adult, teen, Unteen - you are sure to adore this book. -Nina Vigil, age 11. Stone Soup.